[This is the third part of the writer’s account of his work on the sound-track of the movie “The Birdman”]. OK dear readers, I left you as we were getting the run-down on Chinese music and instruments from Dr. Lui at UCLA’s Anthro-musicology Department. I played my cassette tape of the session over and over in the car and in my house during the next few days. Then I called Curt Berg, who already had The Birdman’s theme written and I went over to his place to hear it. I thought it was beautiful and we discussed how it could best be arranged. Since Curt is an arranger, he was accustomed to thinking in terms of several instruments, musical textures, and so on. Des-pite all that, we decided the most effective way to express the feeling was a single wood flute played loose and free. Curt was swamped with work, so I volunteered to put the rest of the score together. By this time the .producer/writer/editor was close to a final edit, and I could get more accurate counts to tell me how many seconds of music I needed. Many :ompromises are made on a low-budget film like this. He and his backer were already over budget, an almost standard predicament for filmmakers because something in-variably goes wrong and scenes must be reshot or re-recorded. I mention this to explain that getting by as cheaply as possible without sacrificing quality is the major concern of small, independent film-makers, and consequently, those who compose and produce the music for them. I took the job knowing I wouldn’t make much money or have a big budget to work with. I did it because Bernard does quality films. I enjoy working with him it’s a challenge, and when he gets a shot at a major feature film I’ll be there. ed advantages other than the obvious financial ones. I could take my time, do lots of takes and experiment without being clock (and budget) conscious during the creative process. I should also mention the negative aspects. I had to be extra conscious of quality. because I don’t have a noise reduction gear and while mixing several tracks together I had to be concerned about noise buildup. Thankfully the score doesn’t have to be as noise free as records because the playback systems used with 16mm films are themselves noisy, and there are other sounds on the film (waterfalls etc) that will mask some noise. • Don’t use noisy instruments. I had to can a popular brand of contact pickup because the pre-amp was too noisy. • Use a graphic equalizer, if poss-ible, to de-emphasize noisy fre-quencies as much as possible without affecting the sound quality ‘of the instrument. For example, if you’re recording a bass instrument, you’ll be able to reduce the noise in the upper frequencies without aff-ecting the sound. It’s more difficult with mid-range instruments as the character or timbre of the instru-ment (or voice) is often dependent on overtones that occur within the “noisy” frequencies, so it’s all compromise at that point. • Record at as high a volume level as possible without distortion. This is called recording “hot”. The idea is that when you finally mix it to the film, you may only need half that volume and the noise will be reduced along with the music. * When mixing your music at home, before transferring it to “mag stripe” (the sprocketed audio tape that’s used to mix the sound to the film) mix it mono onto a full track if possible. Half track will do, and quarter track is the least desirable. The more signal on the tape the better. Make sure you mix as “hot” as possible without dis-tortion and that all the levels of the individual pieces of music you take to transfer to “mag stripe” are uniform so that during the transfer you don’t have to mess with volume for each one. John Braheny met Eric Bettelli and Michael Dolan right before they were going to publish Music Connection magazine. Eric and Michael wanted to get their publication out to as many songwriters as they could. They had already heard of the LA Songwriters Showcase, and of John and his partner, Len Chandler. John’s goal was to advertise the schedule of guest speakers and performers at the weekly Showcase… so they made a deal. They published John’s Songmine column (he had never before written a magazine article!) in their very first edition, in November 1977. Trading out the column for advertising, this arrangement continued for many years. Plus, Eric and Michael came to the Showcase each week and distributed free copies to the songwriters! 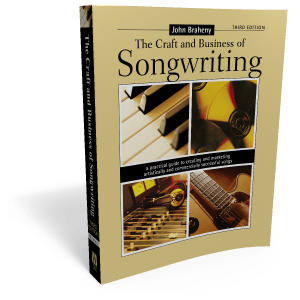 Those articles became so popular that (book agent and editor) Ronny Schiff offered John’s articles to F&W Media, where they became the backbone of John’s textbook, The Craft and Business of Songwriting. As a follow-up, Dan Kimpel (author, songwriter, teacher), who had also worked at LASS, took on the Songwriting column at Music Connection magazine which continues to this day! You can subscribe to get either hard copies or online.